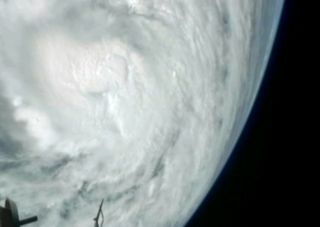 This still from a NASA video shows a view of Hurricane Sandy on Thursday, Oct. 25, as the Category 2 storm approached the Bahamas. The video was taken by cameras aboard the International Space Station 240 miles above Earth. The immense size of Hurricane Sandy has been captured by cameras on the International Space Station from its perch hundreds of miles above Earth. The space station soared over Hurricane Sandy on Thursday (Oct. 25) as the storm reached Category 2 strength on the Saffir-Simpson wind scale while making its way toward the Bahamas. The storm battered the Bahamas late Thursday and has been blamed for 21 deaths as it passed through the Caribbean, according to media reports. The U.S. National Weather Service dubbed Sandy a potential "Frankenstorm" in an alert Thursday due to the chance of the hurricane merging with a cold front and transforming into a hybrid storm next week, just before Halloween. "The current forecast track from the National Hurricane Center brings Sandy in for a landfall in central New Jersey on Tuesday, Oct. 30," Rob Gutro, of NASA's Goddard Space Flight Center in Greenbelt, Md., explained in a statement. "Regardless, it appears that Sandy may be a strong wind event for the U.S. mid-Atlantic and Northeast." Hurricane Sandy was about 85 miles (137 kilometers) south-southeast of Great Exuma Island at the time the space station sailed overhead on Thursday at 1 p.m. EDT (1700 GMT). The storm had maximum sustained winds of 105 mph (169 kph) and was moving northward at about 16 mph (25 kph). According to Gutro, Hurricane Sandy grew substantially on Thursday, stretching more than 410 miles (660 kilometers) across by mid-afternoon. The storm swelled in size by 120 miles (193 km) just in the morning hours alone. NASA and the National Oceanic and Atmospheric Administration are keeping a constant watch on Sandy's development using satellites orbiting Earth. NASA's Terra satellite and NOAA's recently revived GOES-13 weather satellite have tracked the storm in visible light and infrared imagery as it made its way through the Caribbean Thursday.